Exhibition extended until August 25th! A theme that becomes a journey, discovery, knowledge, emotion: the dream. Some of the great protagonists of contemporary art reveal themselves through intimate, visionary works. In a remarkable place: the Chiostro del Bramante in Rome. With eyes open or shut, by night or day, kept secret or made real: an exhibition about desires, expectations, fantasies and exorcized fears. An exhibition that allows spectators to give shape to their own dreams. Dream is an allegorical journey towards the most secret part of the human soul; the theme of dreams is developed through the idea of a journey, and, according to Sigmund Freud, constitutes the channel or “the royal road” for entering into contact with the unconscious and the spiritual dimension. The exhibition, curated by Danilo Eccher, considers the dream as an element of reflection, of discovery, as a private expression, as a gateway into the deepest space of the soul. Site-specific works alternate with works redesigned for the spaces of the Chiostro del Bramante, in a sequence that turns into one big story, thanks partly to the direct involvement of the artists. The exhibition itinerary is imagined as an experience that leads the public from the darkest zones to the meditative dimension and on to the heavenly spaces of the soul. It is a journey that is physical, surreal, mental and dreamlike, leading the spectators through a series of stages and passages, stops and re-starts: from immersion in nature to a confrontation with shapes, from the evocation of personal and collective memories to contact with matter, from shadows, sounds, and darkness towards total immersion in light. 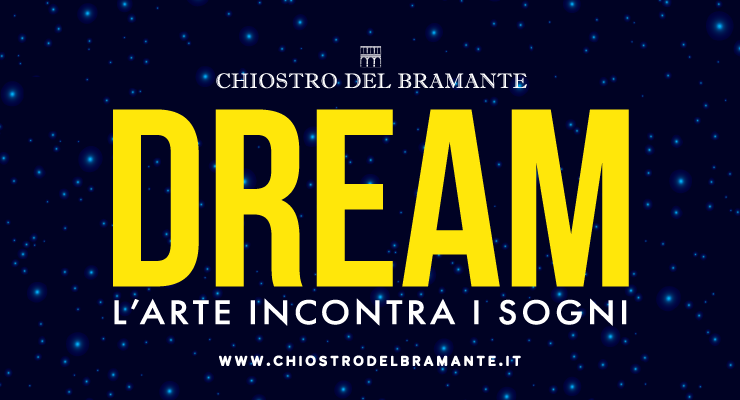 Dream completes the trilogy conceived and curated by Danilo Eccher for Chiostro del Bramante, which began with Love (2016), followed by Enjoy (2017). Three great exhibitions dedicated to the most intimate human emotions represented through the many poetics of contemporary art; three panoramas that are capable of exploring the feelings of the soul: from the ambiguity of desire to the most exhilarating joys and on into the unconscious. In the setting of Donato Bramante’s perfect Renaissance architecture comes the first homage to the world of dreams: two imposing female faces with their eyes closed face each other and accompany us into the world of dreams (J. Plensa). Opening hours: All Days, from 10.00 am to 8 pm. Saturday and Sunday, from 10.00 am to 9 pm. The tickets office close one hour before. Reduced € 12,00 > companion for differently abled; guides with a card; Wanted in Rome Card holders; Cartafreccia card-member associates in possession of a Frecce ticket with destination Rome used in the 5 days prior to the presentation of the ticket at the ticket office of the Chiostro del Bramante; from 11 to 18 years. € 130 including booking + € 5 each student. € 130 + € 5 per pupil | € 140 in a foreign language + € 5 each student. Childhood and Primary | € 20 reservation + € 5 each student. First and Second Degree | € 30 reservation + € 5 each student. 1 November 10.00 – 21.00 | 8 December 10.00 am – 9.00 pm 24 December 10.00 – 17.00 | 25 December 17.00 – 22.00 | December 26th 10.00am – 9.00pm 31 December 10.00 – 19.00 | 1 January 10.00 – 21.00 | 6 January 10.00 – 21.00 | 21 April 10.00> 21.00 | 22 April 10.00> 21.00 | 25 April 10.00> 21.00 | 1 May 10.00> 21.00 | the ticket office closes an hour earlier. All Days, from 10.00 am to 8 pm. Saturday and Sunday, from 10.00 am to 9 pm. The tickets office close one hour before.